In this new project curator Tatiana Paleeva presents yet another view of the relationship between modern life and the ancient culture of Tibet, and the mysterious charms of a land that has for centuries fascinated and attracted European outsiders. Tibet has the power to open up new facets of life, whether philosophical, religious or artistic. Who are we? Where do we come from? How do we relate to surrounding reality? How do we know ourselves? And how can we hear silence? We cannot answer these questions for you, but we can present the unique experience of each of the contributing artists in their contact with Tibetan culture. The East Meets West Gallery is known in Moscow, Hong Kong and China for exhibits dedicated to the arts and crafts of the minority peoples of Southwest China. In this new project curator Tatiana Paleeva presents yet another view of the relationship between modern life and the ancient culture of Tibet, and the mysterious charms of a land that has for centuries fascinated and attracted European outsiders. Tibet has the power to open up new facets of life, whether philosophical, religious or artistic. Who are we? Where do we come from? How do we relate to surrounding reality? How do we know ourselves? And how can we hear silence? We cannot answer these questions for you, but we can present the unique experience of each of the contributing artists in their contact with Tibetan culture. Alena Telpukhovskaya has traveled to Tibet several times, and in “My Tibet” she presents her photographic recollections. “It’s like a sudden inspiration or creative obsession, when something calls and you surrender to it, and in doing so attain an unexpected understanding of life and death in your experience…”. In her photographs she deals with four major themes: light, life, death, and learning. As Buddhists say, every breath brings us closer to death, but great truth is also found in life, in gaining experience and serving others. “Everyone comes to their own truth. I’ve passed different periods in my understanding of life, but Tibet was the real beginning of my spiritual quest”. 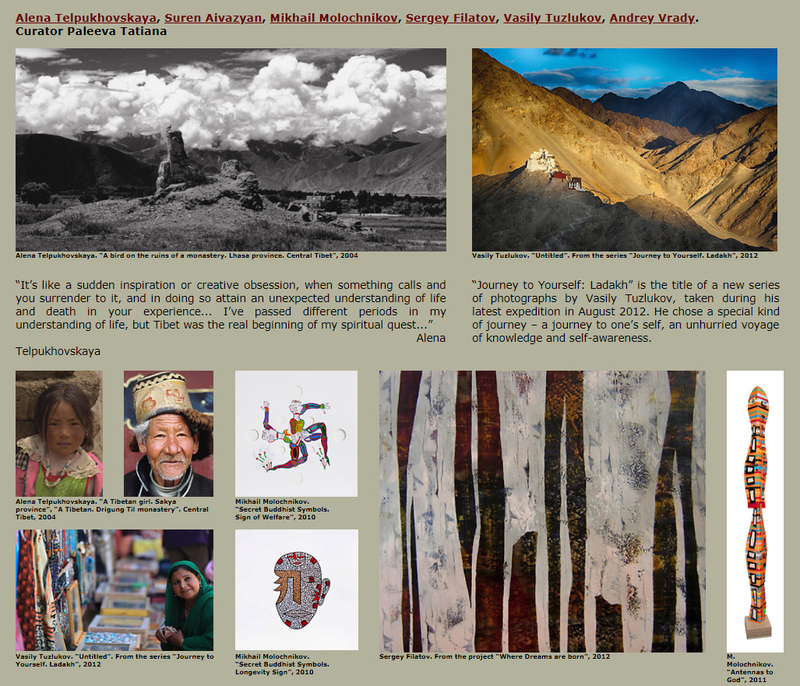 “Journey to Yourself: Ladakh” is the title of a new series of photographs by Vasily Tuzlukov, taken during his latest expedition in August 2012. He chose a special kind of journey – a journey to one’s self, an unhurried voyage of knowledge and self-awareness. “For such a journey actual travel is not strictly necessary. However, there are places on earth that act as a magnet for such introverted travelers, and one of them is Tibet”. Vasily’s work doesn’t force itself on the viewer immediately, but rather envelops and absorbs them to nourish the imagination. Sergei Filatov is a follower of Sri Ramana Maharshi and thus his works are an act of self-discovery, as the Maha Yoga school uses expressive art to answer the question “Who am I?”. In his teachings Sri Maharshi preferred silence to discourse; in his view equanimity and peace of mind worked better than any words. Sergei notes three differences in his new series “Where Dreams Are Born” from his previous works: a new approach to composition, an unusual technique for creating multilayered paintings, and brighter colors in all fifteen compositions. Mikhail Molochnikov also is a practicing Buddhist. The East Meets West Gallery is proud to present for the first time sculptures from his series “Antennas to God” and several drawings from “Secret Buddhist Symbols”. An antenna is an archetype of a person who communicates with God, and the streamlined biomorphic forms of Mikhail’s sculptures remind us that the first generation of living organisms on earth are closely connected to water. Meanwhile, his graphic works are based on an old manuscript recommended by his Buddhist teacher, a Tibetan lama and doctor. The book contained early symbols from the pre-Buddhist Bon religion widely practiced in ancient Tibet, mainly associated with shamanistic practices in the north-western Tibetan region. Suren Ayvazyan presents graphic art works made in the contemplative silence of the Himalayan mountain landscapes of India and Nepal. “It was cloudy for the entire two weeks of my trip and I was not able to see the major peaks of the Himalayas. Every morning I watched the sun rise over the mountains, and in the afternoon I watched sunlight cover the walls of nearby buildings. During the day I soaked original Indian paper in tempera and at night I hung it out and prayed that it would dry properly. For two weeks I looked at distant landscapes and practiced “loud yoga” with brushes and buckets. But after examining the results I sadly realized that my pictures would never replace the sky”. Andrey Vrady is an artist, designer and photographer who creates intricate and unusual works by combining collage and digital images, geometric ornaments often with ethnic tones, banal urban landscape photos and many other objects that happen to be on hand at the time. The result is a complex and very contemporary mix of printing, graphics and screen printing on fabric. New works from Andrey’s series “Four Views” will be presented as part of the “Temple of Silence” – an installation that resembles a typical Buddhist temple from afar. It is a place of silence and stillness, a place where one can listen to his breath and heartbeat. The temple is constructed by the group of artists led by curator Tatiana Paleeva and decorated with contemporary printed textiles by Andrey Vrady. 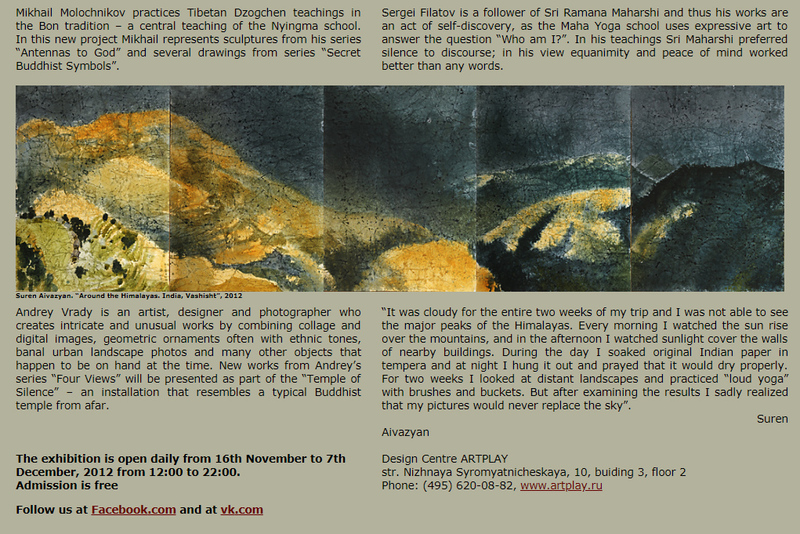 We are pleased to invite you to “Tibet: Infinity of Silence” at the ARTPLAY Design Center from November 15 to December 7, 2012. The center is open from 12:00 to 22:00, and admission is free. Follow us at Facebook.com (www.facebook.com/home.php#!/groups/202029846503227) and at vk.com (http://vk.com/al_feed.php#/event36241653).